Kitchen Capers Forum Index -> C is for Cookie! I've edited your photo to make it larger. And also corrected the colours(too much blue in it..could be due to not enough lighting, the digicam often does a quick colour shot). I used the Photoshop software to even out the hues of blue and green and post it here for you. Will email to you the modified version. Do reload it here for your posted recipe. 1. Soak the beans for at least 2 hours, steamed and mashed. 2. Add sugar, salt & white pepper to the mashed beans. 4. Pour in the bean mixture. Fry till mixture dry and can make into a ball. Divide filling into 100 pieces. 7. Wrap B around A. flatten it and roll it up. Flatten again and roll up. 8. Flatten and wap the filling in it. 9. Brush with egg, top with sesame seed. 10. Bake - 350 F for 10-15 mins. Rolling of the dough as in rolling of swiss roll right? It is like swiss roll. This is to get the flaky skin. My SIL gave the recipe through the phone, so not sure how to write out the steps. Usually I only roll it up twice. Can I check where can I get the mung beans? Thanks for posting the recipe. 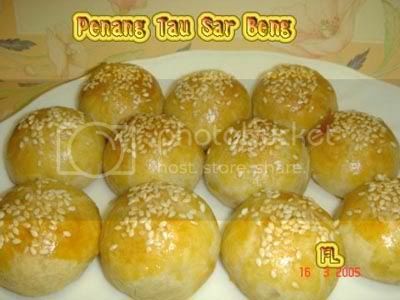 Your picture of tau sar beng looks so good. My mom always bought a few boxes when we visited Penang ages ago, your picture brought back the memory for me. the mung beans is also known as the yellow split beans which is used in making tau suan or making the Ang Koo kuih fillings. How to do the Photoshop colour changes ar? I teached Photoshop too..besides Cooking! Anyway, you need to understand about colour on computer screens and how to manipulate them. What I do as idiot-proof and leaving it to the Photoshop to figure out for me is to use Auto Levels(found in Image...Adjust). If that doesn't work, then I manually adjust by using Variations(Image...Adjust). The thing is I know how the food colour in real life is supposed to look like. So when I used Variations to adjust the colour, I just do it enough to get the right hue. In Variations, you can adjust HUES and Contrast. And if you take a photo with the flash on, sometimes its overexposed. You can use Photoshop to do an Auto Colour and Auto Contrast to bring the photo back to normal. Thanks for the tips. Cross checking over the manual (which is in Chinese and software in English) so have problems understanding! yeah..I know..the manuals in HK are often in chinese! and the software is always in English!! This is the Tau Sar Beng that I made this afternoon. Thanks tthksy for the recipe. By the way, do you have the recipe for sweet mung bean filling as I have sweet tooth and I didn't realize this is the salty kind until I tasted it. Still good though. The skin is soft and flaky. However I ended out with lots of leftover mung bean paste (in the freezer now) and also I had to bake mine for 30 mins. me impressed leh..! with your young baby you still find time to make this. seems to me its alot of work. How many did you make? Aren't you showing off at buddies.net? Balachan, very pretty tau sar beng. Gina, should I post it at mybuddies? Dunno leh... not my recipe and not sure if tthksy mind or not eventhough she is fully credited of course. Tthksy, do you mind? I have to give recipe when I post right? Or not? show off pictures should be okay. If members want to learn, then have to come here and learn. becoz the 'owner' is the best person to answer any queries about making the dish. Made half portion of the recipe and I got 40 pieces. Dough A reduced oil from 130g to 115g (easier to handle). Dough B reduced oil from 250g to 220g. My pastry skin is thin but if you like thicker pastry skin you can try 5g of dough A with 15g of dough B and 15g - 16g of filling. I did not make any changes to the filling and the filling is very nice. Thank you tthksy for posting such a nice recipe. I ate 3 pieces for tea break with a cup of hot honey tea...yum...yum...yummy! WOW Florence, your tau sar beng looks even nicer, no cracks one. Btw, did you have a lot of leftover filling or just me? Oh, I forgot to add...since I'm lazy I didn't divide the dough into portions first, just use my hand to grab one piece of this and one piece of that. Did you roll yours with a rolling pin or just by hand? Since I'm lazy again, I followed tthksy and only roll it once instead of twice (hand roll). Do you think it makes any difference? I use 300g mung beans and have a lot left as well. I did use the rolling pin and rolled my dough swiss roll style twice. I use rolling pin to roll the dough ball into long rectangular shape then roll up like swiss roll, make a 90-degree right turn, flatten it into long rectangular shape then roll up like swiss roll again. I think you should divide the 2 doughs into proportions otherwise too much or too little of each dough might cause cracks. From your pic, not all bengs have cracks...might be one of the reasons. I also made adjustments to the the baking temperature and time. Mine needed 10 minutes at 200C on the upper rack to get the golden brown colour. I did that because after 20 minutes at 175C, the bengs were still pale in colour. Thank you for answering my questions! Great help! 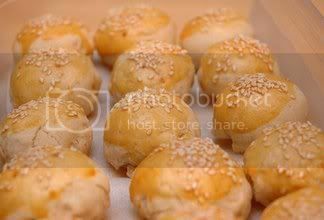 While exercising on the bike just now, I read a Chinese book on this kind of pastry and it seems that after mixing the Dough A ingredients and Dough B ingredients you should leave this 2 dough to prove/rest for 30 minutes in a sealed bowl. That is, cover the bowl with a wet towel to prevent the dough from drying up. This way, the pastry skin will be smooth and have no cracks. Looking back on baking this yesterday, I did rest the 2 doughs for more than 30 minutes because after mixing the doughs, I went on to fry the filling before I do the wrapping of dough A and dough B and then the rolling. Ha...ha, so that why my pastry skin is smooth! Bonus by mistake! Usually one will cook the filling first!!! Usually I will divide everything, filling, dough A & B. Then that way I won't have any left overs. If you don't like the white pepper, you can omit it. You can also use black sesame seeds to decorate. Also, I keep some in the fridge, heat it up when u wants to eat. Very happy everyone is enjoying the tau sar beng. Also thanks to Gina for having this forum. I enjoy it every much. I'm a FTWM with 3 kids ( 11,9,19 mths), so not much free time to bake. Only bake when the kids request. Oh tthksy! You must be real busy! Your youngest is only 19 months old. Do you have anyone to help you along? You are so clever, manage to squeeze time to bake for the kids. Having 3 is already handsful. Anyway, do stir up more home town dishes! Looking forward to see more of your bakings. I made more than 70 tau sar beng yesterday, my hubby's family came last night, and they love it. I let them eat one tin, and his sis even bought home one tin. Now, I left with 3 tins, 2 for my mum and sis, one for ourselves. The only problem that I encounter is when I mix dough A, I need a lot more than 230g flour with 115g oil to form into ball. 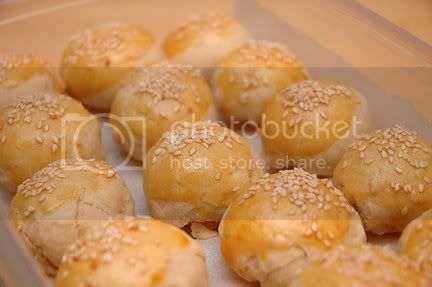 Overall, I find that the filling is superb and the beng is very flaky and delicious. Tried this yesterday. For me, it was harder than I thought but then that's because initially, I was not used to handling and wrapping the dough. So I took a long time during preparation. Had a bit of a problem weighing dough A so I gave up trying to and instead just estimated the portion that is required. Ended up having extra dough A in the end! I only managed about 32 pcs. 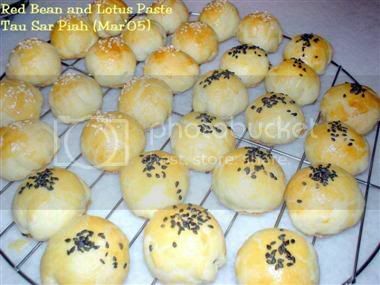 Also for a quick & easy way, I used store-bought Red Bean paste (black sesame seeds) and Lotus paste (white sesame seeds). I rested the dough (like what Florence suggested) and I see no crack in the dough after baking. Overall I must say that I like them a lot (mine were quite crispy). My family and friends too, based on their compliments. Thanks so much for the recipe and to Florence too, for your suggestions .